It’s Summer in the city and that means the people cycling look even more relaxed than usual. On a beautiful afternoon I took my camera and went to the car-free city centre of my hometown ʼs-Hertogenbosch. On the main square I just pointed it at people passing by. Summer cycling in the main square in ʼs-Hertogenbosch. This is the mail man passing by. 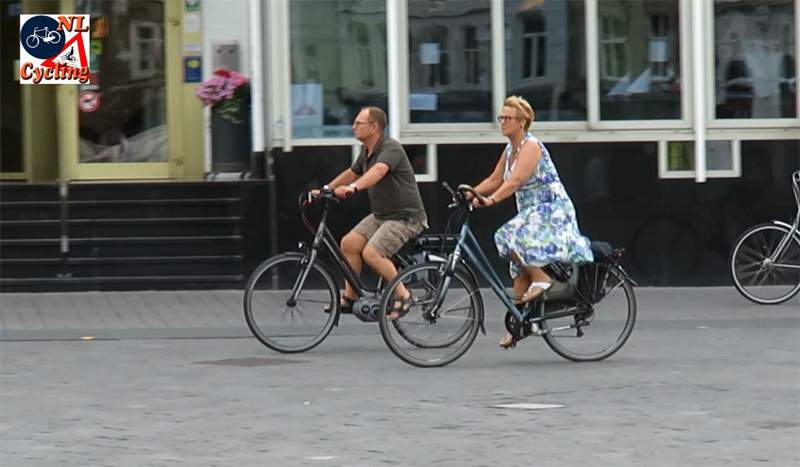 Almost all cities in The Netherlands have made their historic city centres inaccessible for motor vehicles and they did that often long ago (only deliveries can be done in certain time windows) but there are only a few cities that allow people cycling in these pedestrianised areas. ʼs-Hertogenbosch is one of them and as you can see it works very well here. It is interesting that this is pedestrian space where bicycles are the guest. 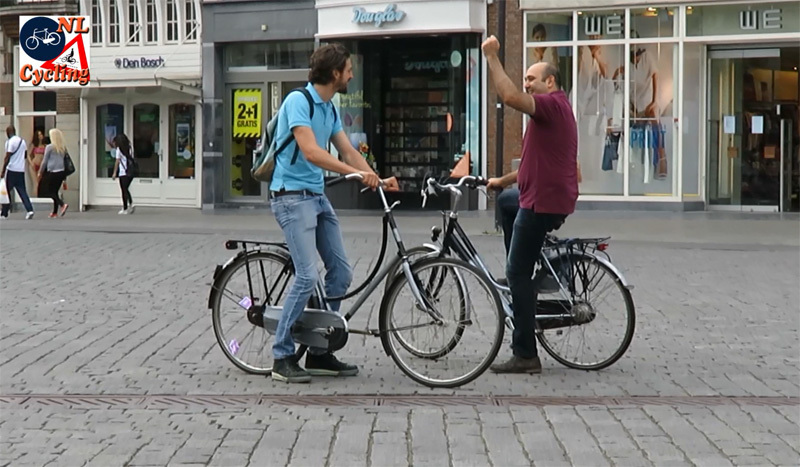 In other areas, notably the ‘fietsstraat’ (cycle street) the main user is the bicycle and the cars are guest, but sometimes people cycling need to behave as the guest as well. In effect this is shared space, but then only shared between pedestrians and people cycling. Short boy on a big bike. Tall woman on a small bike. I filmed this shortly before and after the shops were closing (at 6pm) and we can see a whole range of people doing different things. This would be the time of evening ‘rush hour’, but ‘rush’ is certainly not the word that comes to mind when you watch all these people. Some clearly return from work, others have done some last minute errands. They carry groceries for their evening meal or other things in bags. One boy even rides past carrying a bicycle tyre. 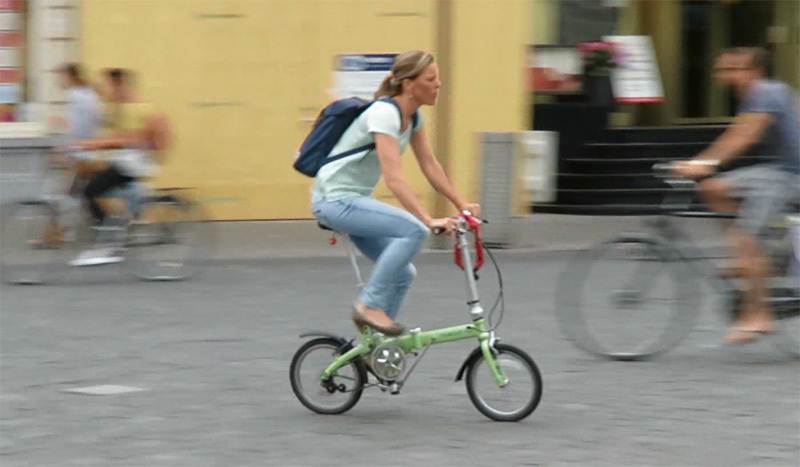 People cycle alone or together, in work attire or in their casual summer outfit. One man passes on his recumbent and one woman on a racing bike passes in full cycling gear. Many people greet each other and two men even stop to have a pleasant chat before they continue on their separate ways. A whole young family riding. 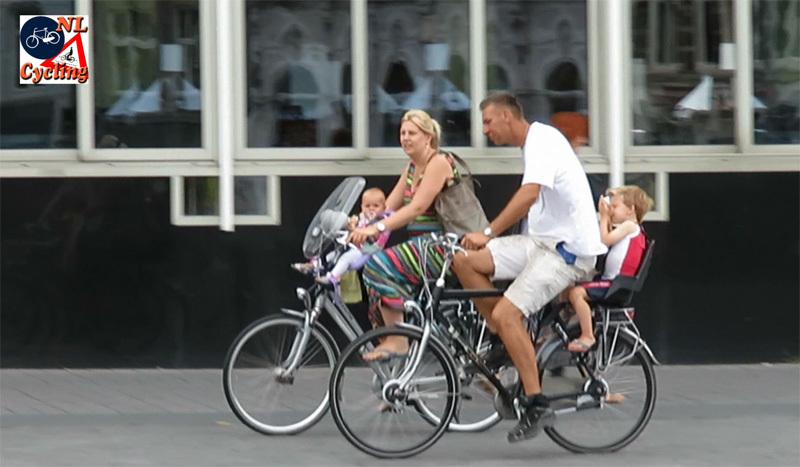 the Dutch cycle often with their babies and toddlers. Cool boys and a cool girl. The number of women seems to be slightly higher than men and that confirms the statistics. Dutch women cycle a bit more than men. We also see many age groups cycling. 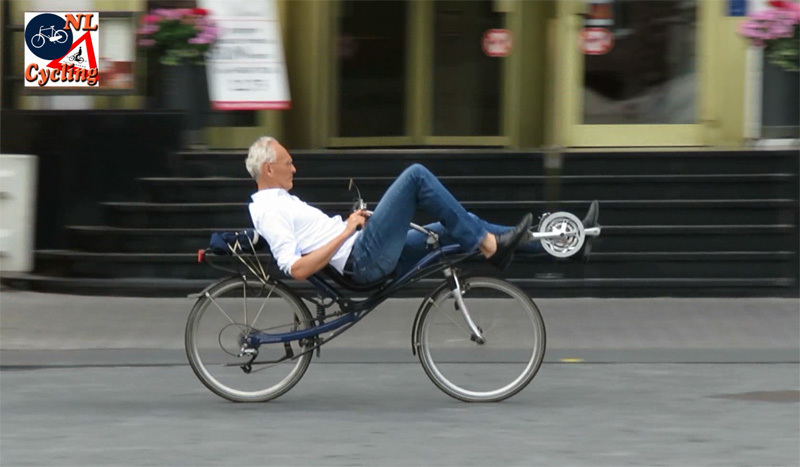 Most of all this cycling is done in a very relaxed way. 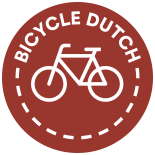 That is one of the main characteristics of cycling in The Netherlands; it is so easy and relaxed that everybody can and wants to do it. Having an animated conversation after a chance encounter. This man seems to return home after work on his recumbent. Bike sharing in a different way. Returning after a recreational ride? He seems to have picked up this girl from her after school activities. That tyre would have liked a bit more air! Great post, as always. I find the contrast between London where Bozo felt he had to apologize for giving his wife a ‘Backie’, but never for the lack of bike infra :-(, and there where it looks like one would be considered rude if one did NOT offer. And the bike there would be built to do it too ;-). 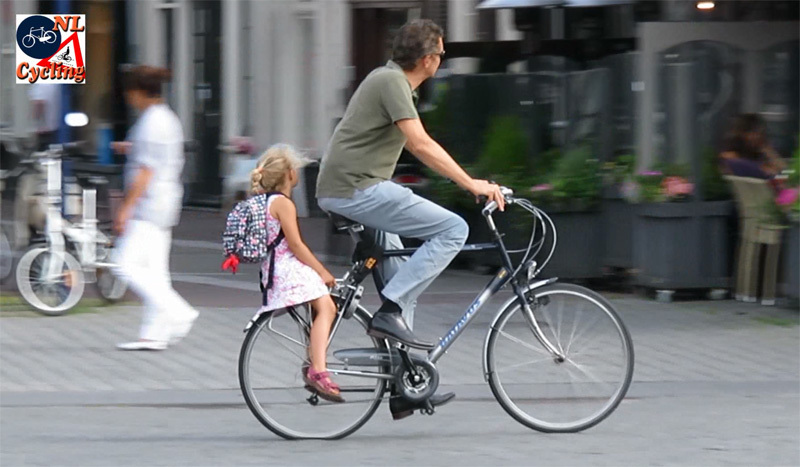 Actually, most dutch bikes are not ‘built or designed’ to carry a passenger. Most cycle shops recommend against it. The carrier is usually rated for a maximum load of 25kg. However, it’s very common practice, and many people wouldn’t buy a bike that wouldn’t survive such abuse. And bikes that don’t get removed from the bike pool earlier. Cycling in Hertogenbosch looks such a relaxing experience. Wonderful. Thank. Greetings from Tasmania, many many thanks for this and your other videos, this looks like my wife’s idea of heaven! She just about lives on her bicycles! Even more than your other great videos, I love this! Thanks! Might the Dutch call pedestrianized roads verkeersvrijestraats? the right plural of straat is straten so verkeersvrije straten. You could call it that, but it sounds a bit odd. Usually we simply call it “voetgangersgebied” which means pedestrian area. Also, pedestrians are technically verkeer. They’re not vehicle operators (bestuurders) like motorists or cyclists, but they’re still traffic. 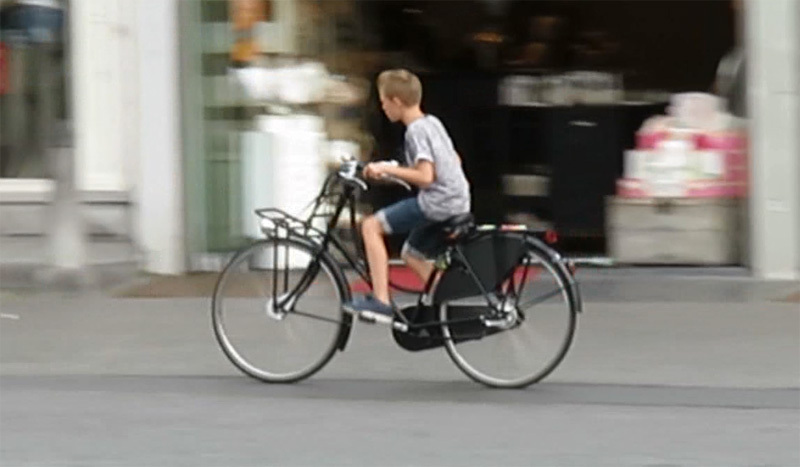 This entry was posted on 28 July 2015 by Bicycle Dutch in Original posts and tagged ’s-Hertogenbosch (Den Bosch), rush hour, shared space, watching people cycling.